Space Wolves - Iron Wolf company. Greetings! It seems that only yesterday I was writing a long apology for not updating my blog for some time…Well, another year went by and I was not able to work on anything worth mentioning on this blog. My personal life keeps me too busy and at this moment doesn’t allow too much hobby time. 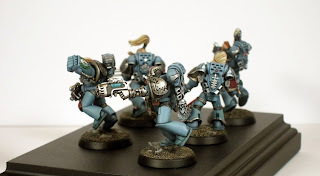 The only significant hobby related activity that I had for the last year was teaching a couple of classes at Adepticon this year. 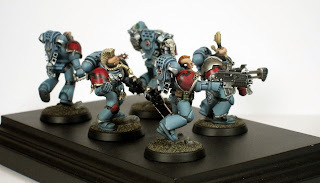 It looks that things are turning around and I am hoping that soon I will be able to get back to my “meditation chamber” and put some paint on all the models that I have laying around. In the meantime, I decided to show some of my old stuff. 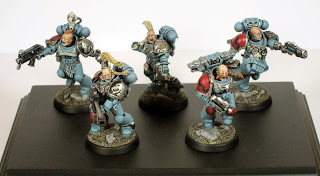 Couple of months back I received a request on Bolter and Chainsword via PM to show some of my Space Wolves that I painted back in 2010-11. 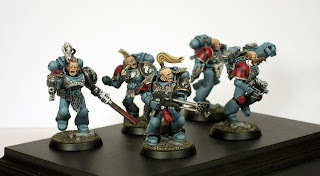 The only pictures I had were the ones that GW made for their website, so I decided to take a couple more to show my wolves from different angles. I am really bad with the camera but I tried my best, so please keep this in mind. 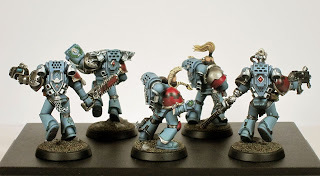 There are a couple of things I wanted to mention about my Wolves. It is sort of an ongoing project. At the end I am hoping to have a small high quality SW force that I can proudly display in my figure case. I originally decided that I want to paint some SW back in 2009 when the new SW was released. 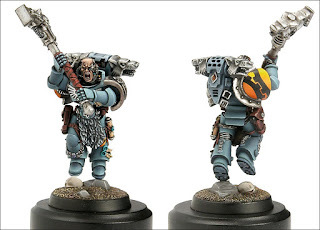 I really liked the new models and when I saw the banner of Iron Wolf company I knew I must paint some. There was very little information about that company aside from it being mostly mechanized. My original plan was to paint five Grey Hunters and have one of them carry the company banner. As I was running out of time my plan was slightly altered. I settled on the color scheme pretty quickly. 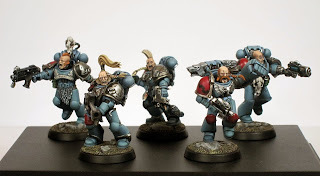 I also wanted my SW to be more “marines” than “barbarians” so I was trying to go light on “wolfy” stuff. The company shoulder pad was originally supposed to be painted but after discussing my project with my friend Chris Borer I changed my mind and decided to try and sculpt the company symbol. Chris’s reasoning was quite solid. The company/chapter symbol will never change throughout marine service, so why not have it more ornate than the pack/tactical symbol. Also, it would be easier to keep it unified through the unit. It was my first try in sculpting (not counting hooves of my purge unit a year before) and it was quite a challenge. It took me almost as long to sculpt the shoulder pad as it took me to paint the entire unit. I was quite please with the end result however. 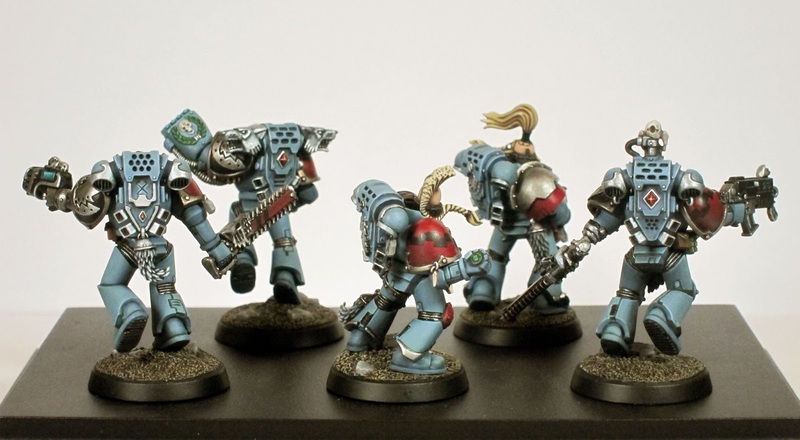 The other two things that I wanted to mention about this unit are the pack markings and “excessive” bionics. I was trying to achieve a more “mechanical” feel to the markings reasoning that it would make perfect sense for an Iron Wolf company. Bionics were used pretty much for the same reason. Overall, I am looking at Iron Wolf company as a sort of “Iron Hands chapter in wolf clothing”. Below is the picture taken by GW and I just added the close up shots of shoulderpads for Grey Hunters, Wolf Guard and the Iron Wolf Company. And here is my Wolf Guard model. 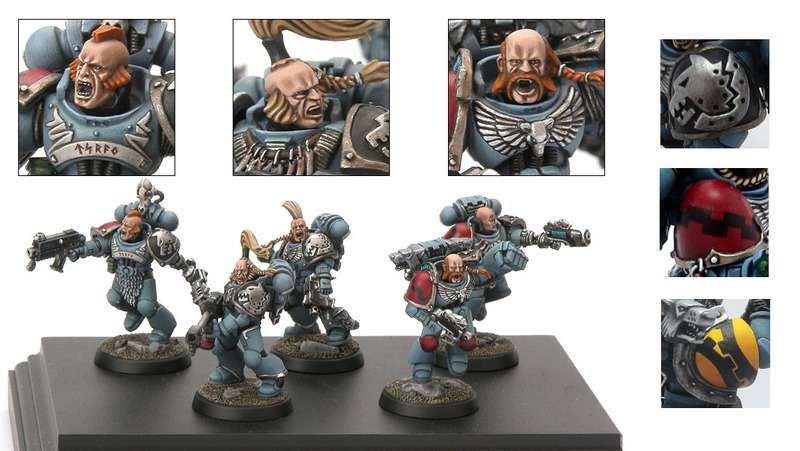 It was converted from Games Day 2008 limited eddition model. 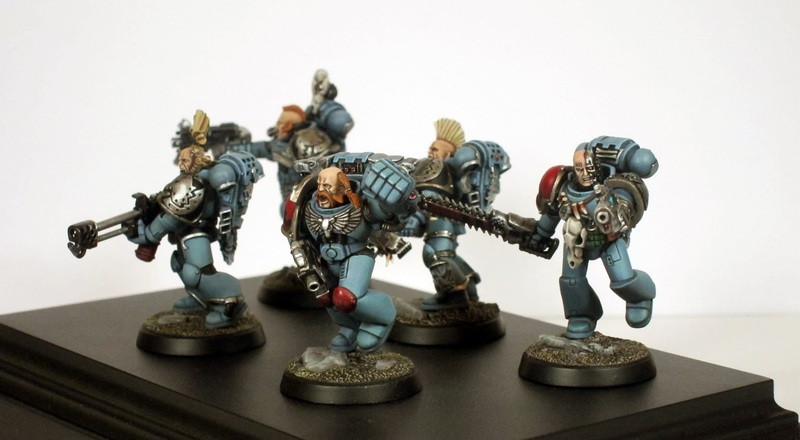 My next step of this project will be a unit of five Blood Claws and another Wolf Guard.